Digital Breast Tomosynthesis/3D Mammogram is a revolutionary new tool that help doctors detect breast cancer earlier then previously possible. This technology allows the physician to see thin mammography sections of the entire breast. This results in better detail without the superimposed tissue above and below each section that can hide abnormalities on the traditional two-dimensional image provided by mammography. Breast tomosynthesis, also called 3-D mammography, the latest mammography technology, can produce three-dimensional images of the breast, which leads to better cancer screening and detection. Using this procedure, the breast is viewed as many thin slices, which can be combined into a 3-D picture. What happens during the breast tomosynthesis? During the 3-D part of the breast exam, the X-ray arm sweeps in a slight arc over your breast while taking multiple images. Then, a computer produces a 3-D image of your breast tissue in one millimeter slices. 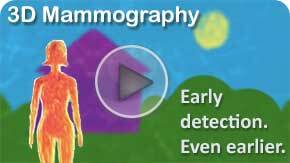 3-D mammography complements standard 2-D mammography and is performed at the same time with the same system. There is no additional compression required and it only takes a few seconds more for each view. For the patient, there is no change in how the images are obtained. Just as in a routine mammogram, Breast Tomosynthesis images are obtained with the breast held briefly in compression. The rotating exposure of Breast Tomosynthesis lasts for approximately ten seconds longer, but the result is a stack of image slices, similar to a CT Scan, that provides clear breast detail. To learn more about how Tomosynthesis works, watch the video above (courtesy of Hologic, Inc.). Typically, the healthcare provider calls, faxes or submits an online request for the breast tomosynthesis exam. Then we call you to confirm your appointment date and time. However, if your healthcare provider asks you to schedule your exam, simply call 1-833-Get-A-MRI or visit our Request an Appointment page. We will make sure the exam is timely and convenient and that it meets any special requirements of your insurance carrier and healthcare provider.